Ticket prices will increase as more tickets are sold. Bust out your best costume and get ready for a spooktacular party like no other this season. 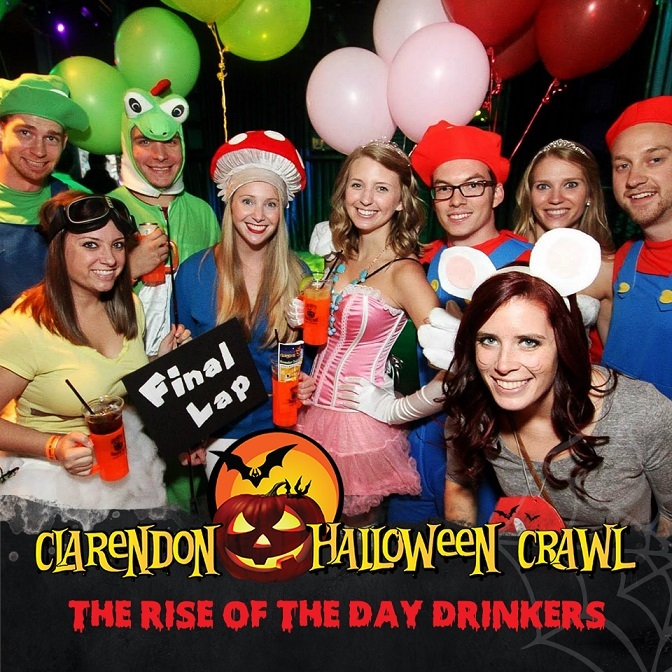 The Clarendon Halloween Crawl celebrates the scariest time of the year in Arlington with thousands of your closest friends! Price: $15 early bird tickets by signing up online. $30 day of the event. What You Get: A souvenir haunted mug, cover-free access to Clarendon’s best bars, exclusive drink & food specials, free pictures of the event and a raffle entry to win great prizes. Exclusive specials at each stop! Participating bars: Clarendon Grill, Mister Days, Whitlow's, Pamplona, Bar Bao, Oz, Hunan One, Whitlow's Rooftop, Courthaus Social, and more bars to be announced. Dress code: We recommend wearing your spookiest, scariest, or most creative costume! There will be costume prizes for the most festively dresses participants. By proceeding with registering for the event, you acknowledge and agree that you have carefully read and fully understood the waiver and agree to the terms set forth below. 2) I voluntarily, knowingly and freely assume all risks associated with attending The Clarendon Halloween Crawl in Arlington, VA and entering the premises, including, but not limited to, my own actions or inactions, injuries, illness and contact with others. 8) I understand that the event may be photographed and/or video recorded. I agree to grant Project DC Events the rights to use any photographs, video recordings, and/or sound clips taken of myself during the event for any all promotional, advertising and/or trade purposes, without compensation, notification, or permission. 9) I, the user of this ticket, and on behalf of my estate, heirs,and trustees, hereby release and hold harmless Project DC Events LLC from any and all claims, losses, injuries, or damages to persons or properties, and from liability for injury, disability, or death, and costs that may arise out of or in any way relate to the event and/or my attendance at the event. Project DC Events does not assume liability for damages as a result to the use of any service, product or any material found within this web site. This may include but is not limited to the use of the website system, any content or demonstrations accessed via this web site or any other site to which the web site may be linked to. We reserve the right to modify any material within this web site including but not limited to: product/ and service descriptions at any time without notice. The information posted is believed to be accurate and reliable at the time it was posted. We do not take responsibility for its use, nor for any infringements of rights and or patents of any third parties resulting from the use of the website. Links from third party websites from this site are provided solely as a convenience.